Παρότι το περιμέναμε στην έκθεση της Γενεύης, η Audi παρουσίασε σήμερα επίσημα το SQ7 TDI, το δυνατότερο πετρελαιοκίνητο SUV του κόσμου. 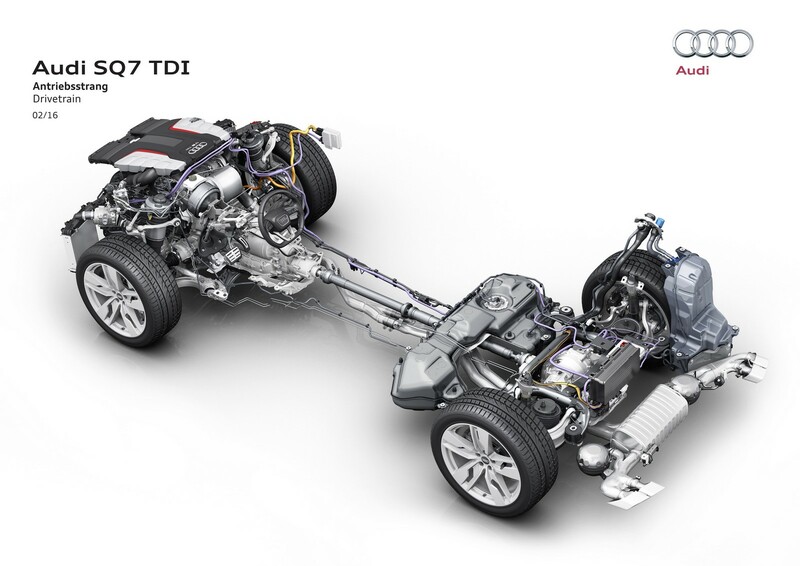 Φορά έναν ολοκαίνουργιο V8 4.0-λίτρων TDI κινητήρα που σε συνδυασμό με έναν ηλεκτρικό κομπρέσορα (EPC), που περνά για πρώτη φορά στη παραγωγή, αποδίδει 435 άλογα με 900 Nm ροπής από τις μόλις 1.000 σ.α.λ. Η ιπποδύναμη αυτή επιτρέπει στο SQ7 TDI να κάνει τα 0-100 χλμ/ώρα σε 4,8 δευτερόλεπτα, με την τελική του ταχύτητα να περιορίζεται ηλεκτρονικά στα 250 χλμ/ώρα. Το SQ7 TDI είναι το πρώτο αυτοκίνητο παραγωγής του κόσμου που φορά ηλεκτρικό κομπρέσορα με 48 Volt ηλεκτρικό σύστημα, με την μέση κατανάλωσή του να ανακοινώνεται στα μόλις 7,4 λίτρα/100 χλμ έχοντας 194 γρ/χλμ εκπομπές CO2. Οι πωλήσεις του θα ξεκινήσουν μέσα στην άνοιξη με αρχική τιμή τα 89.900 ευρώ, έχοντας πλούσιο βασικό εξοπλισμό (περίπου €10.000) σε σύγκριση με την απλή έκδοση του Q7. Έτσι συναντάμε LED φωτιστικά σώματα, ζάντες 20″, σπορ προφυλακτήρες, ενεργή αερανάρτηση με S-specific ρύθμιση, ηλεκτρικά ελεγχόμενα θερμαινόμενα σπορ καθίσματα, Alcantara ουρανό, τριάκτρινο πολυλειτουργικό τιμόνι με paddles, συναγερμό, μεγάλο ρεζερβουάρ 85 λίτρων και αλουμινένια διακοσμητικά. 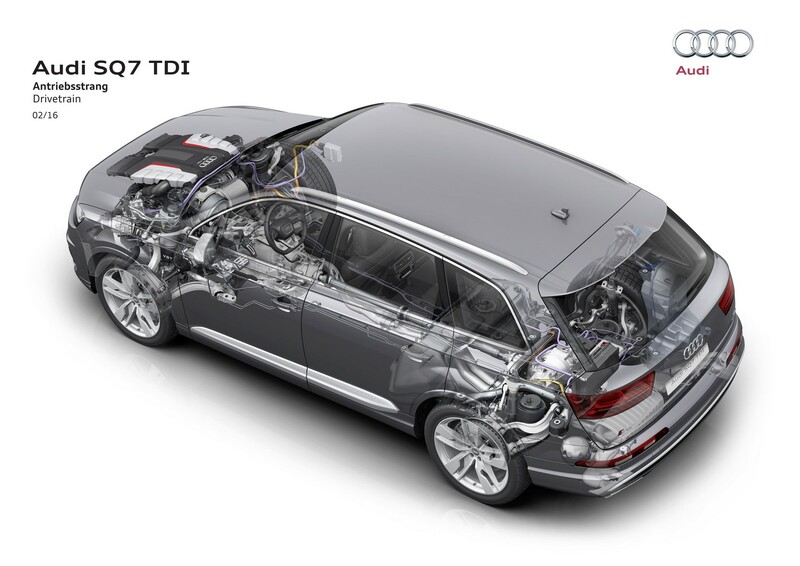 Forced induction: Three chargers working together The 4.0 TDI has been newly developed from the ground up. It combines best-in-class performance with low consumption and guarantees maximum dynamics. The V8 engine has a displacement of 3,956 cc. The two exhaust-gas turbochargers are activated selectively according to the concept of sequential charging, since exhaust gas only flows through one turbocharger at low and intermediate load. The second turbine is only activated at higher loads. An electric powered compressor (EPC) augments the work of the two turbochargers, particularly in the lower engine speed range, providing for extremely dynamic off-the-line performance. 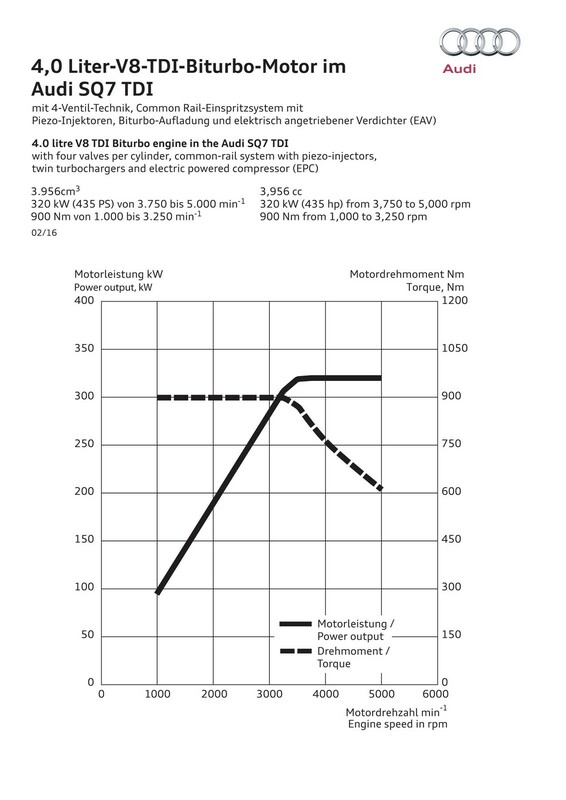 Forced induction concept and electrical system: Electric powered compressor (EPC) and 48‑volt subsystem The electric powered compressor is a world first in a production vehicle. This EPC strongly supports the 4.0 TDI engine when starting off and accelerating from low load for pure dynamics with no turbo lag. It is placed in the air path downstream of the intercooler, close to the engine. Because the EPC does not require any exhaust-gas energy to develop boost, it can be used at any time, thus making it the solution for the traditional weaknesses of the classic exhaust-gas turbocharger. With this technology, turbo lag is history. 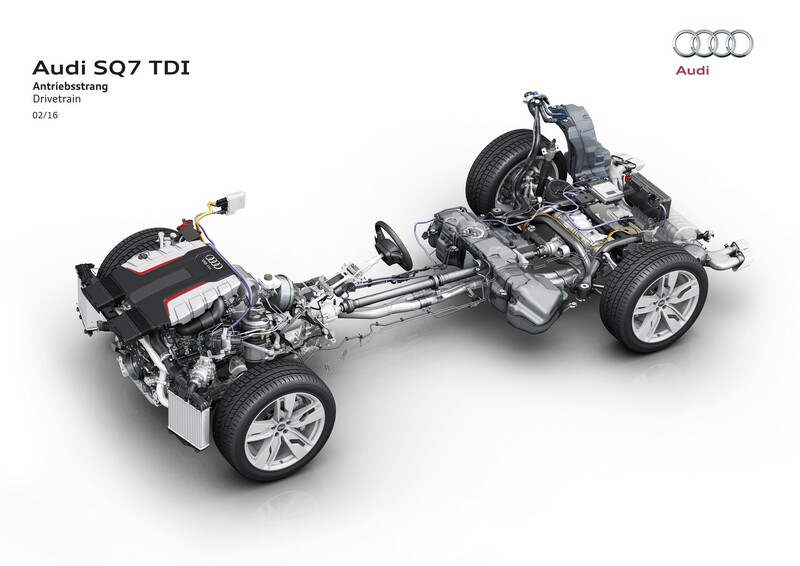 The EPC provides the engine the boost energy needed for the dynamic delivery of power in less than 250 milliseconds. Driven by a compact electric motor, its compressor wheel spins up to 70,000 revolutions per minute. The 4.0 TDI thus develops its immense power with no perceptible lag: It is available immediately upon depressing the accelerator. That is a major plus, particularly when starting off. 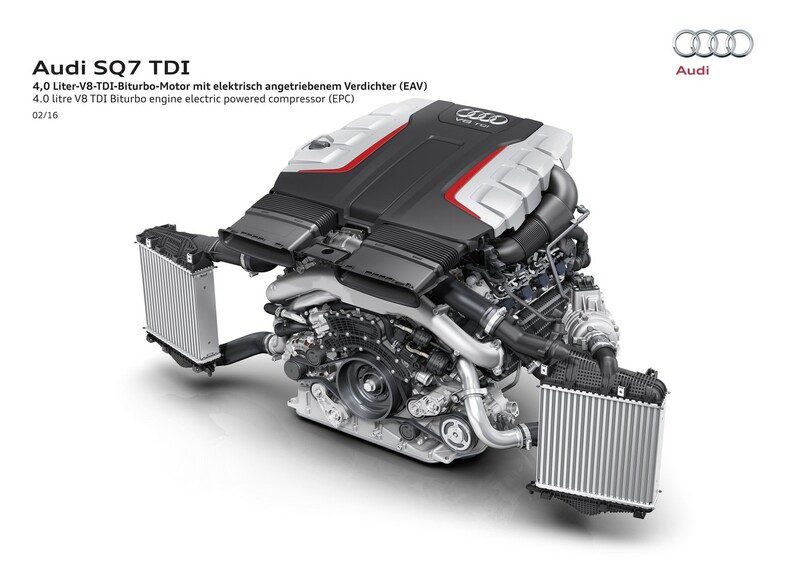 V8 TDI – further technical highlights The intake side of the 4.0 TDI is on the outside, the exhaust side with the two turbochargers is on the inside of the 90-degree internal V. This layout provides for short gas paths, i.e. spontaneous response and short paths for the emissions control system. The common-rail system generates up to 2,500 bars of injection pressure. Ignition pressure reaches the 200‑bar mark in broad sections of the characteristic. 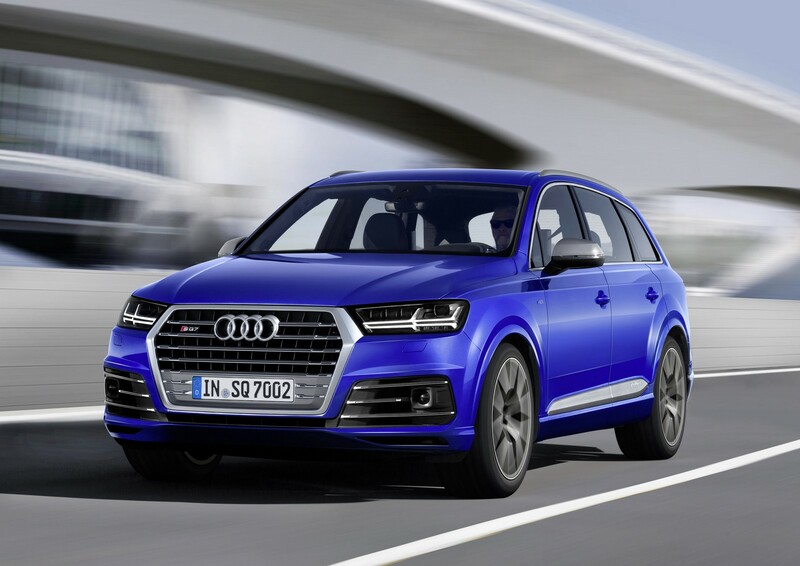 High efficiency: The eight-speed tiptronic The 4.0 TDI in the Audi SQ7 TDI works with strong partners. The proof is in the road behavior, from extremely comfortable cruising on the Autobahn to dynamic handling on mountain passes. The redesigned eight-speed tiptronic is impressively efficient. It changes gears extremely quickly and efficiently, and at high speeds allows coasting at idle. 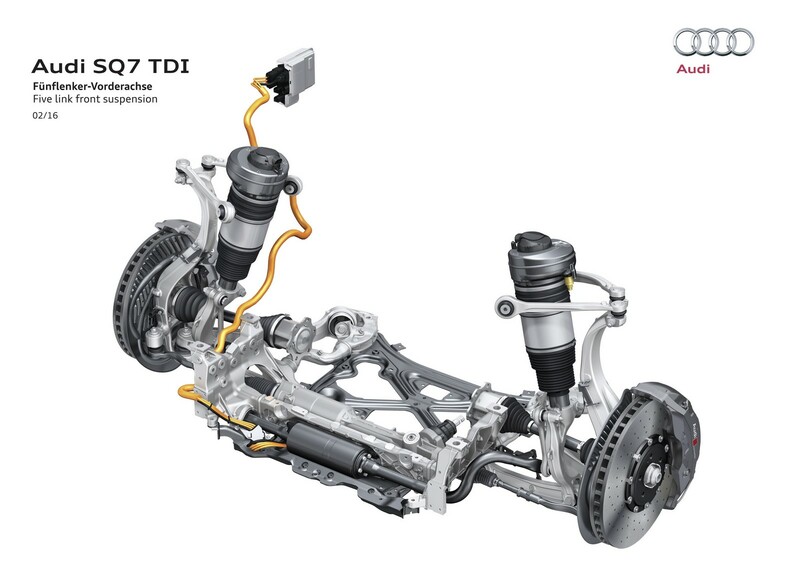 A self-locking center differential is the heart of the quattro permanent all-wheel drive system. It is compact, lightweight and interacts very precisely with the suspension control system. 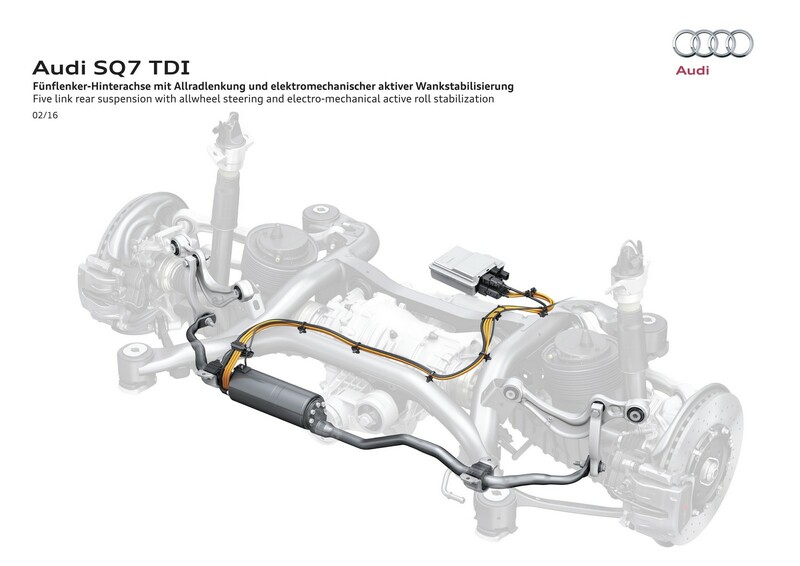 The maxim of lightweight construction also applies to the suspension – its links are made primarily of aluminum. 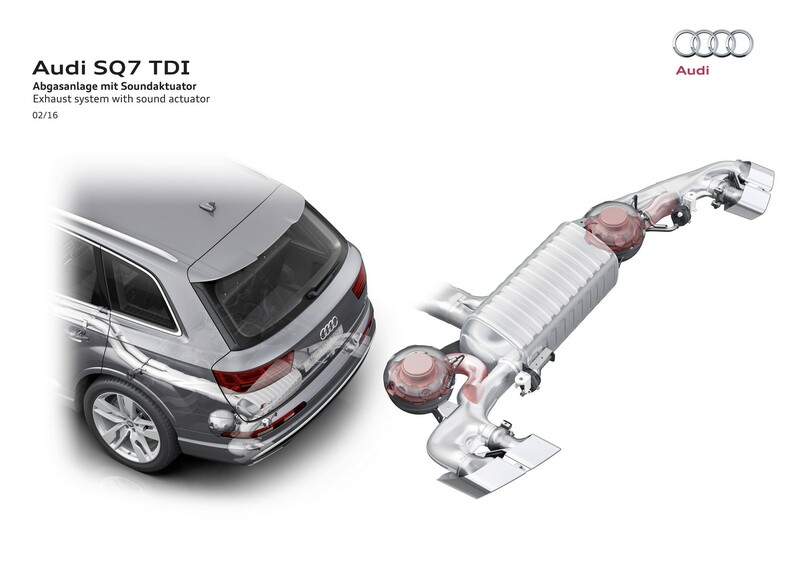 Electromechanical power steering, the Audi drive select driving dynamics system and adaptive air suspension with S-specific tuning are standard. 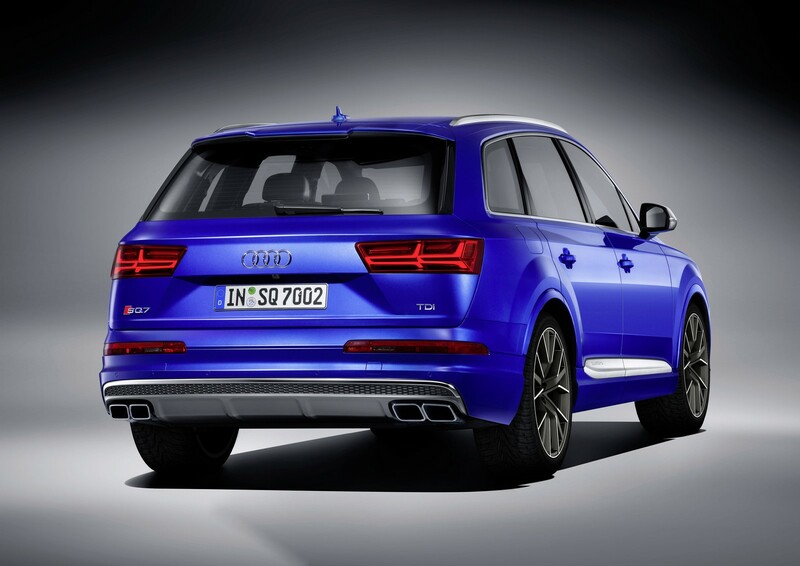 An optional brake system with extremely lightweight carbon fiber-ceramic disks will follow shortly after the market launch. 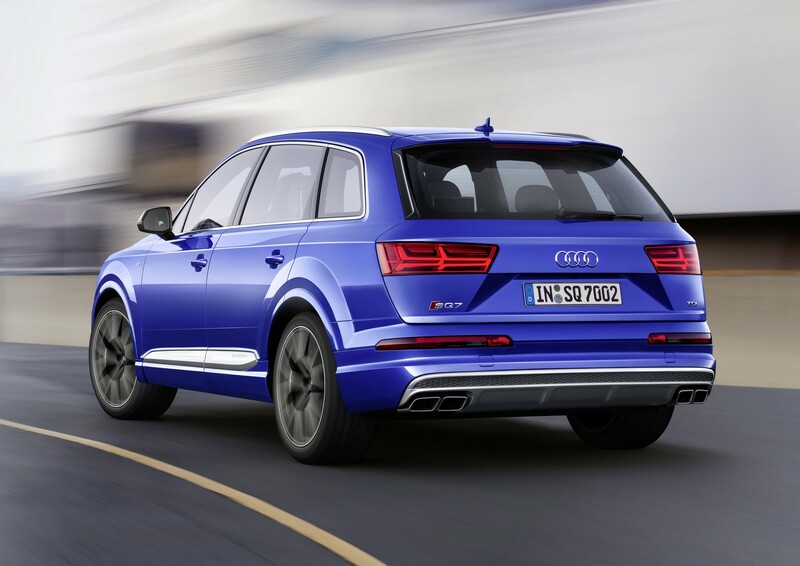 Audi offers the SUV with 20‑inch wheels on 285/45 tires, with options up to 22 inches from the quattro GmbH program. 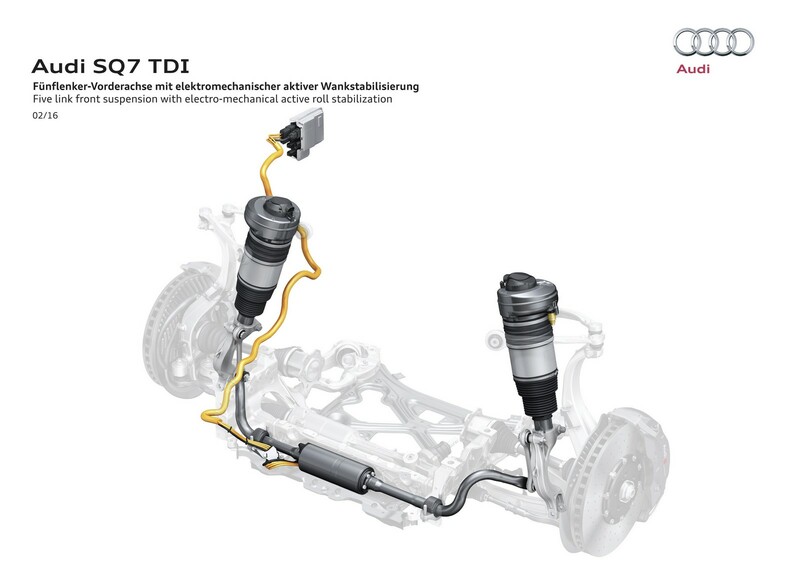 Networked suspension control Audi offers the SQ7 TDI with an optional driving dynamics package comprising three technology modules: sport differential, electromechanical active roll stabilization and all-wheel steering. 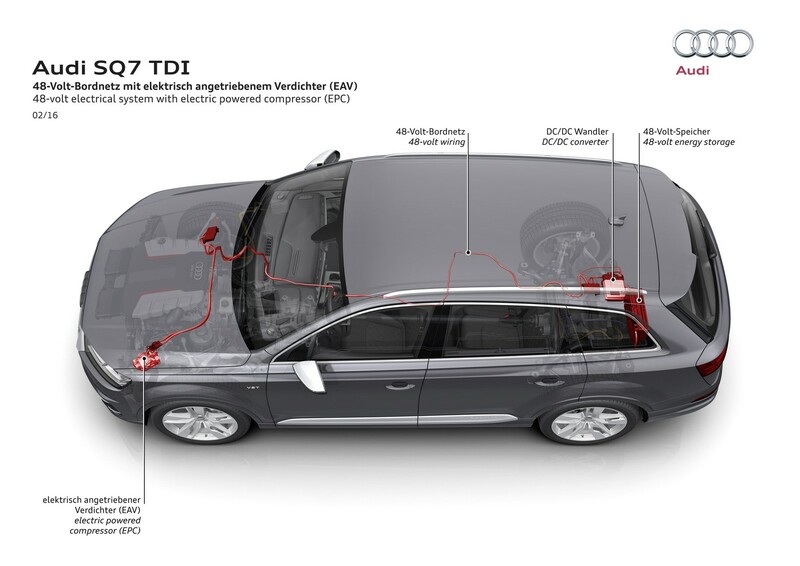 The highly integrated suspension control unit is used in the SQ7 TDI. It assumes the central control of the adjustable shock absorbers, the air springs, the sport differential and roll force distribution. By bundling all relevant suspension functions into a central control unit, the developers achieved an optimal networking and coordination of the functions among themselves. The customer thus experiences outstanding handling in any situation. 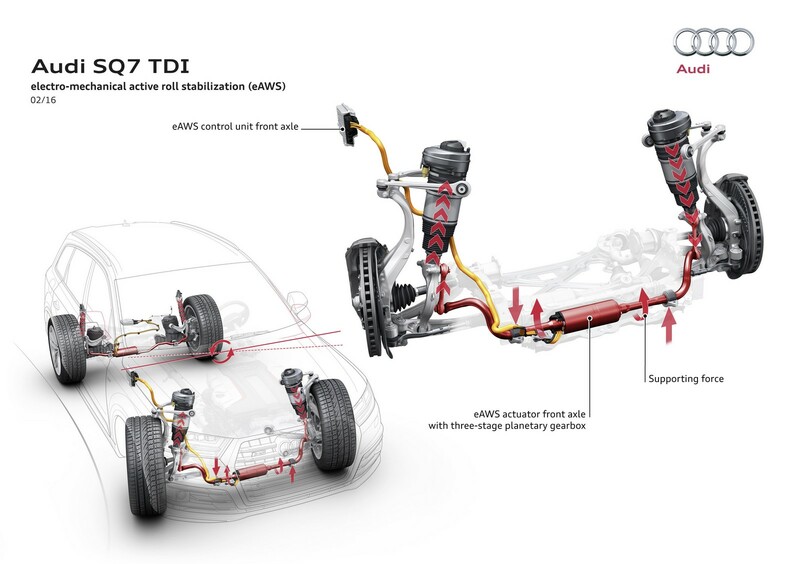 Sporty or comfortable: Body roll stabilization A new solution in the competitive environment is the electromechanical active body roll stabilization. Here a compact electric motor with a three-stage planetary gearbox separates the two halves of the stabilizer. On an uneven road surface, they are actively decoupled from one another, resulting in improved ride comfort. 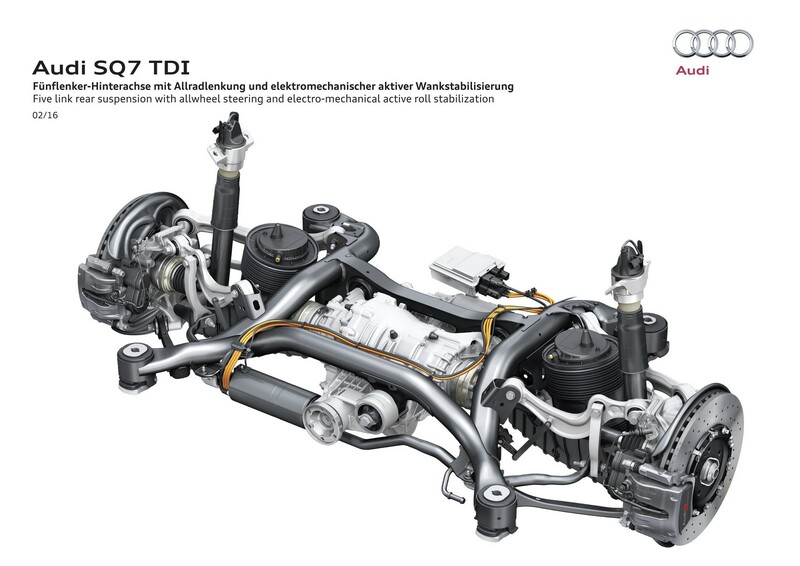 During sporty driving, the tubes are interconnected and twisted against each other. That significantly reduces body roll, i.e. the lean of the car. 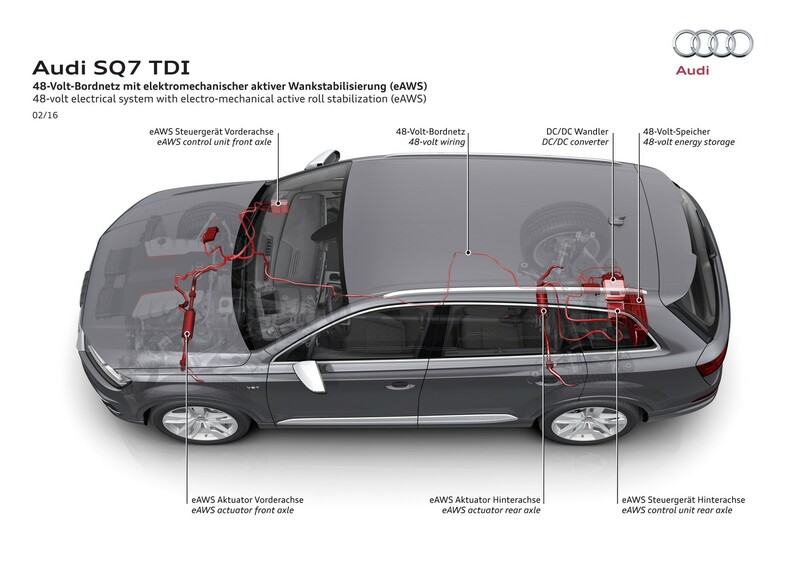 Together with the transmission, the electric motors produce anything up to 1,200 Nm (885.1 lb‑ft) of torque. 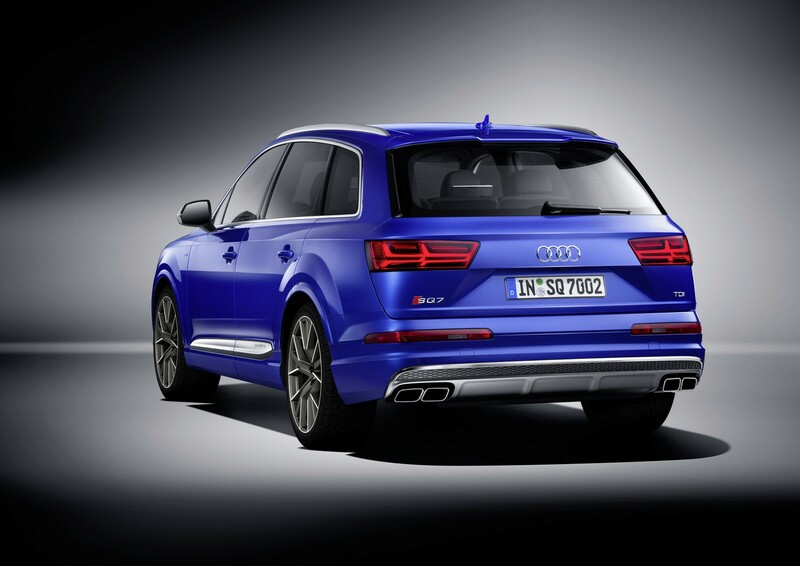 The effect is taut, sporty handling: The car leans less in bends and the tendency to understeer is further reduced. Bold road behavior and handling: All-wheel steering in combination with sporty and direct front-axle steering With all-wheel steering, the rear wheels turn in by as much as five degrees, making parking easier. 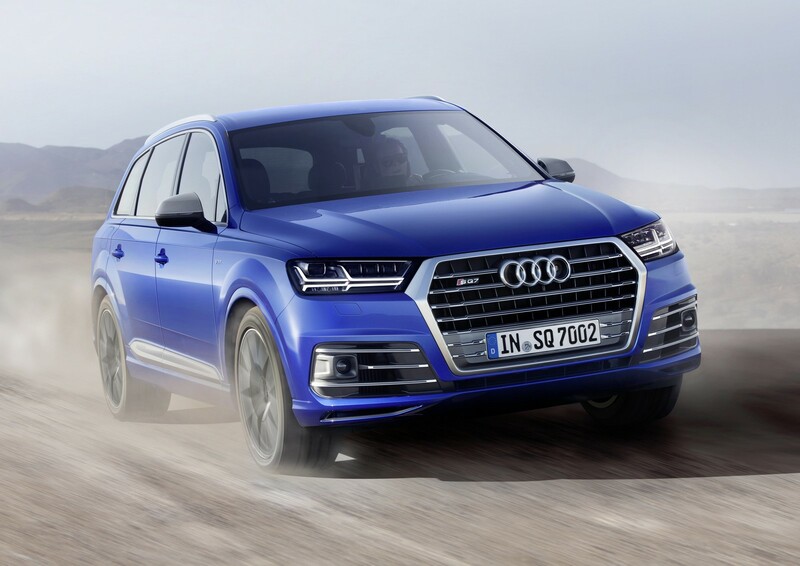 The more direct front-axle steering ratio of the SQ7 TDI improves the handling characteristics. Depending on the situation, the rear wheels steer opposite or in the same direction as the front wheels, improving dynamics and stability. 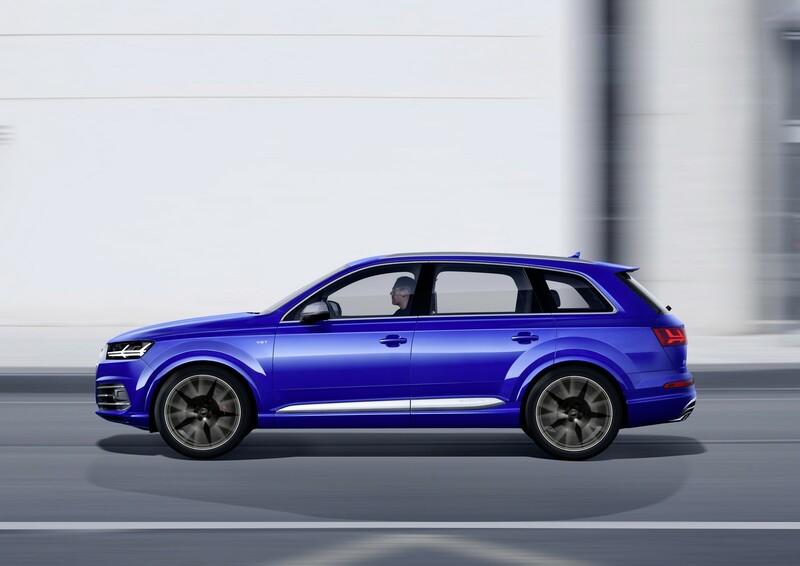 High agility in every curve: quattro with sport differential For sporty drivers, it is one of the central objectives of road behavior: neutral handling up to the limit, even at high engine power. The optional sport differential provides stable and precise steering, particularly when accelerating dynamically out of curves. Variable torque between the wheels on the rear axle offers supreme control in curves. 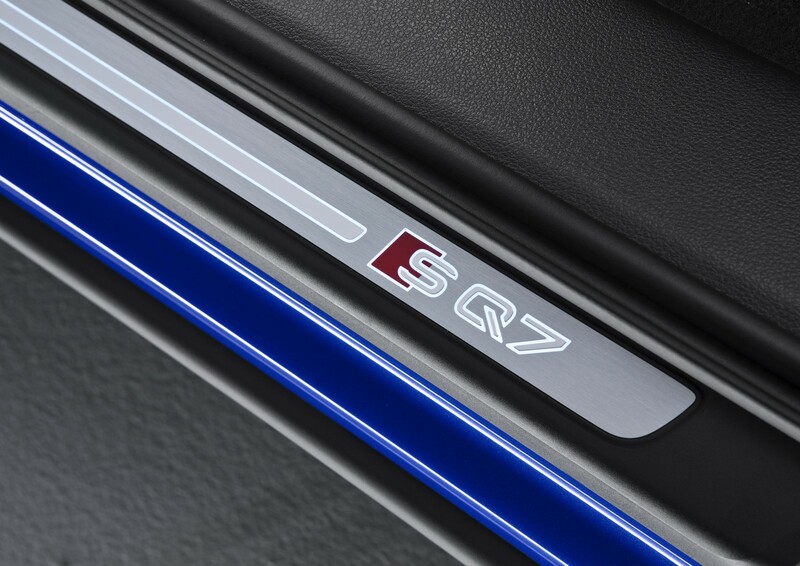 The SQ7 TDI is pressed precisely into the curve as a result. 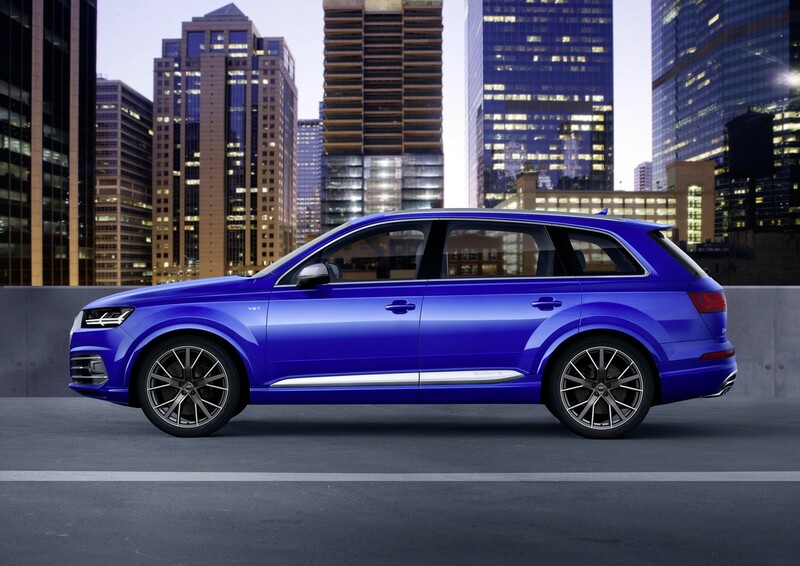 Even if the rear end starts to swing out, the quattro sport differential brings it back under control. 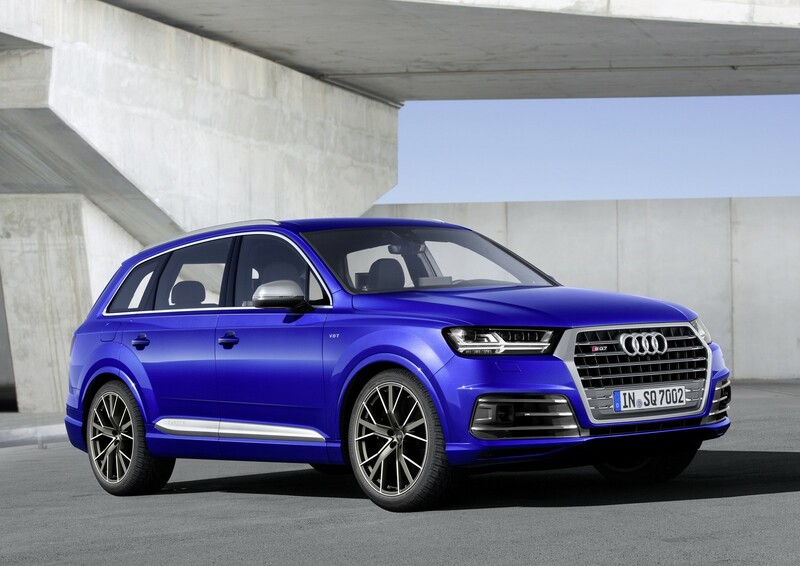 This technology is available for the first time in the Q7 model line and is reserved exclusively for this top model. 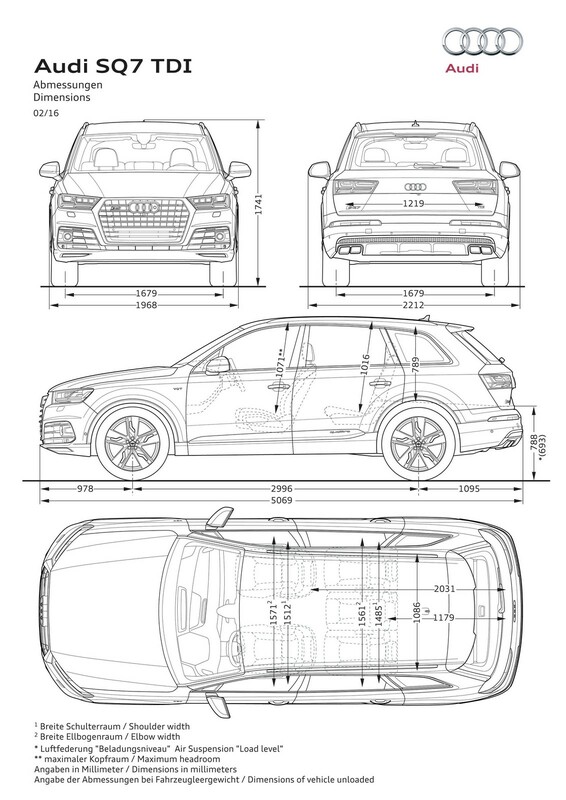 Lightweight construction – innovative multimaterial construction Thanks to systematic lightweight construction, the Audi SQ7 TDI is the lightest SUV in its segment, yet makes no compromises with respect to crash safety. The body features an innovative multimaterial construction. Hot-shaped and extremely strong sheets form the backbone of the occupant cell; the outer skin is made of aluminum. The center of mass is low – another factor for the sporty handling. The drag coefficient is an outstanding 0.34. 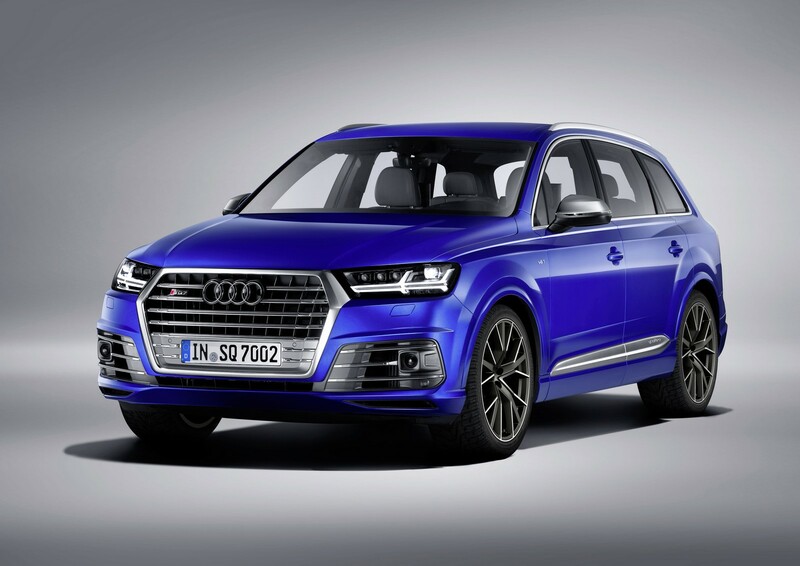 Powerful sportiness: Exterior styling The new Audi SQ7 TDI strikes an impressive balance between powerful and intensified stylistic elements. At 5.07 meters (16.6 ft), it is approximately as long as the base model. 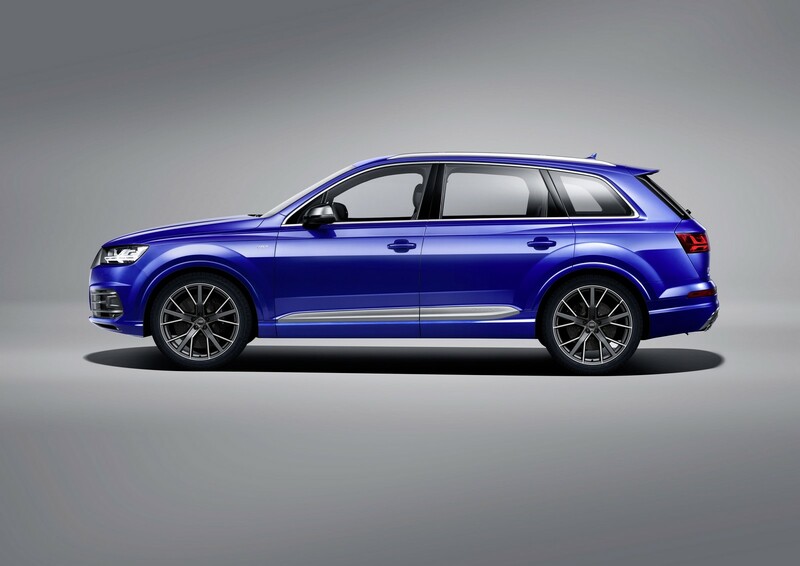 The Audi DNA, such as the sculpted Singleframe radiator grille, distinctively highlighted wheels and flared quattro-style blisters, is unmistakable. All lines and surfaces are designed precisely and incisively, and accentuate the width of the car and thus the solidness of the overall concept. 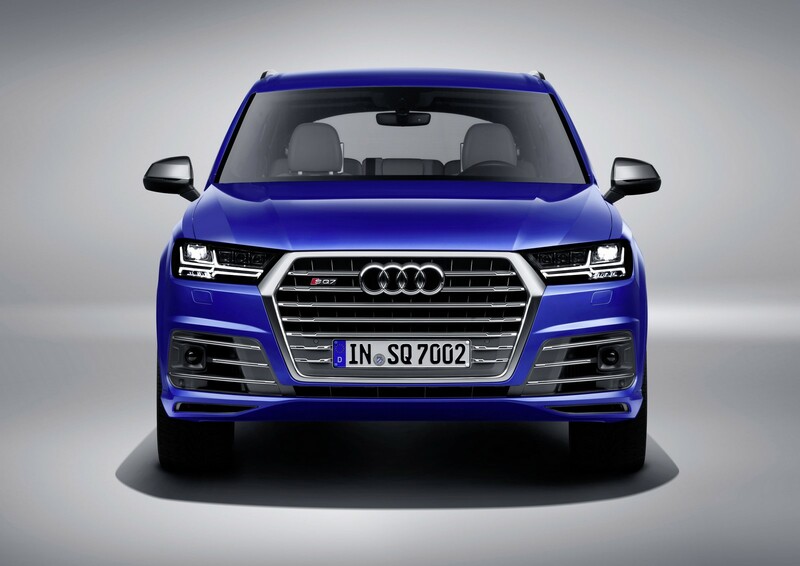 The SQ7 TDI has a new radiator grille with an S‑specific design at the bumpers. Other distinguishing features are the side air inlets, the mirror housings and door inlays in standard aluminum. 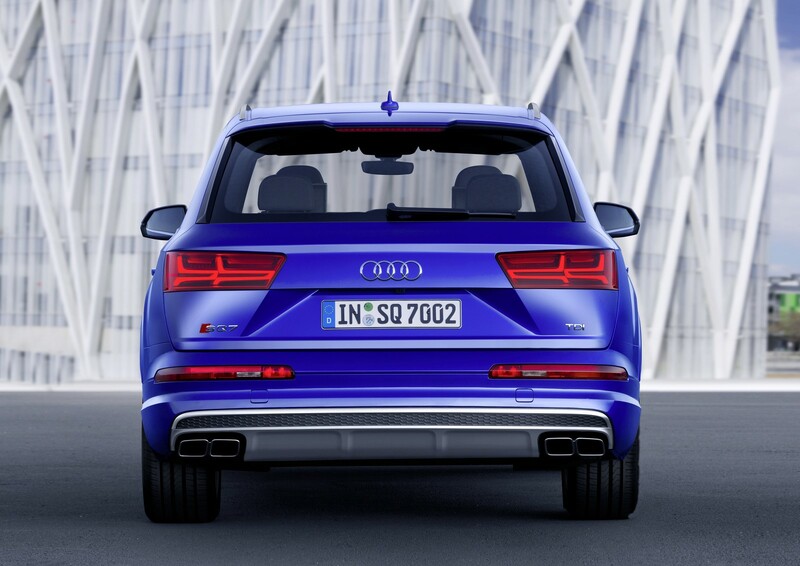 The exhaust system terminates in four rectangular tailpipes. Light – LED headlights standard The headlights have a pronounced three-dimensional appearance overall with a double-arrow signature. 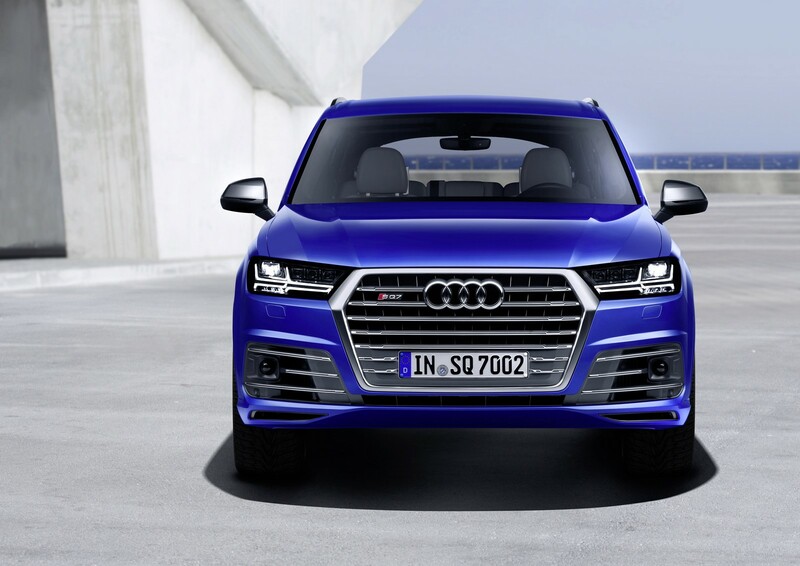 The standard LED and optional Matrix LED headlights plus the dynamic rear turn signals underscore Audi’s leading role in lighting design and technology. 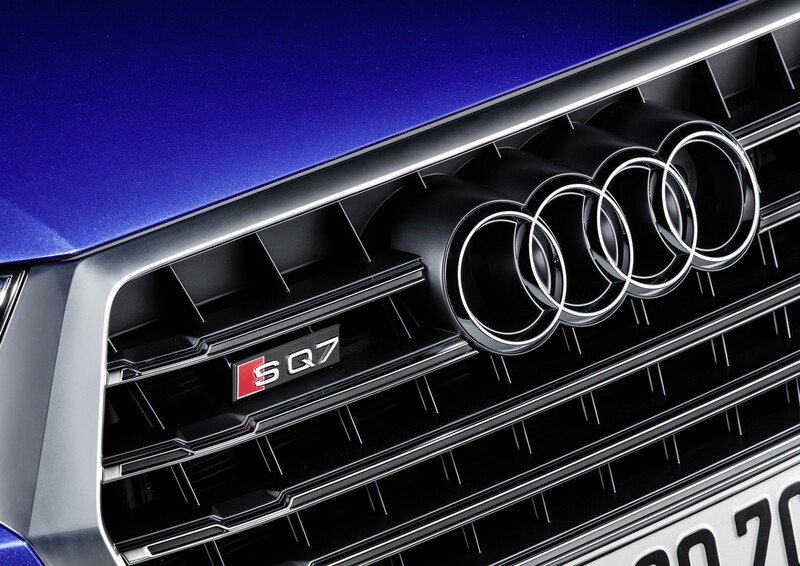 With the LED and matrix LED headlights, the daytime running lights together with the turn signals form a double light guide arrow – a new and unique light signature within the Audi family. Each Matrix LED headlight divides its high beam into 30 individual light-emitting diodes paired with three reflectors. A camera on the interior mirror analyzes the traffic situation. Given this information, the control unit individually turns the diodes on and off, or dims them in 64 stages each, depending on the situation. With the millions of different resultant beam patterns, the high-end headlights superbly light up the road, without blinding other road users. Traffic signs are illuminated with less power so that the driver is not blinded by glare. 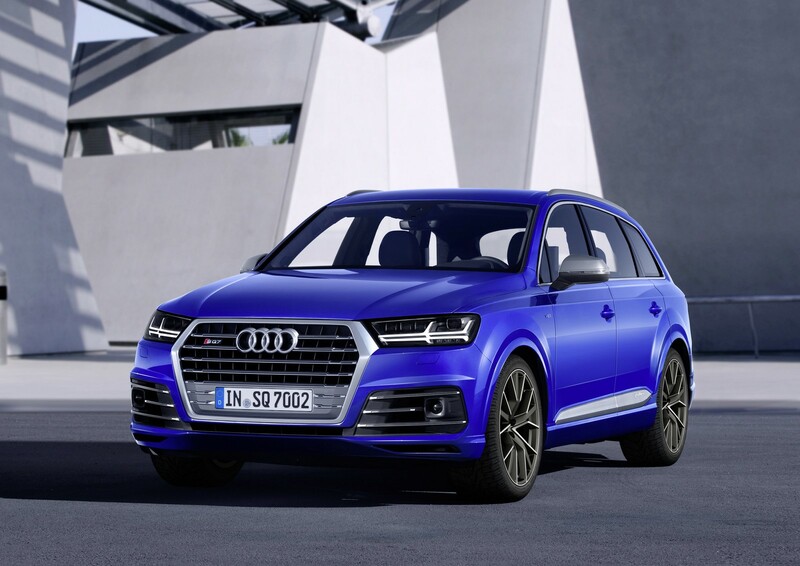 The choice is yours: five seats or seven Passengers in the Audi SQ7 TDI experience the largest interior in the segment. 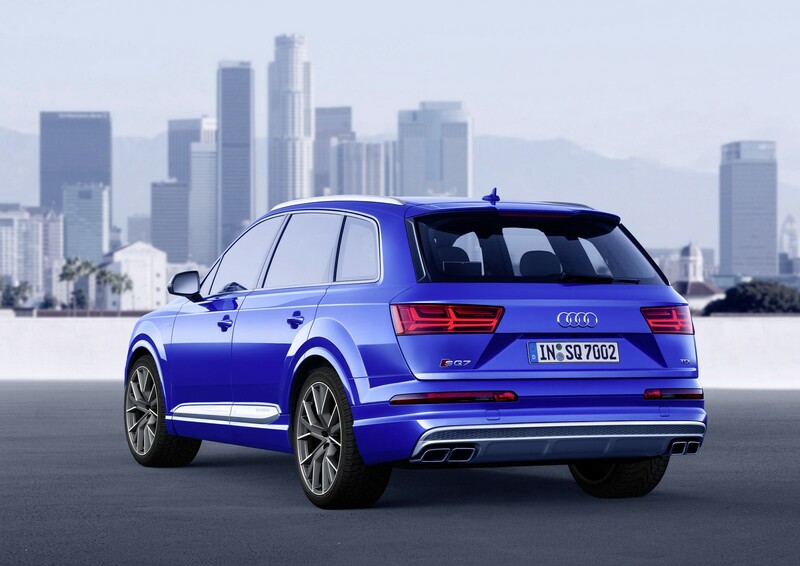 Audi offers the SUV with a choice of either five or seven seats. The second row comes standard with a three-section backrest with segments that can be folded down separately. The optional third row folds up and down electrically. Interior quality with S-specific design language More space in the interior sets a new benchmark in the segment. Diffuser vent wrap and application strips emphasize the horizontality and spaciousness of the interior. Comfort features are luxury-class. 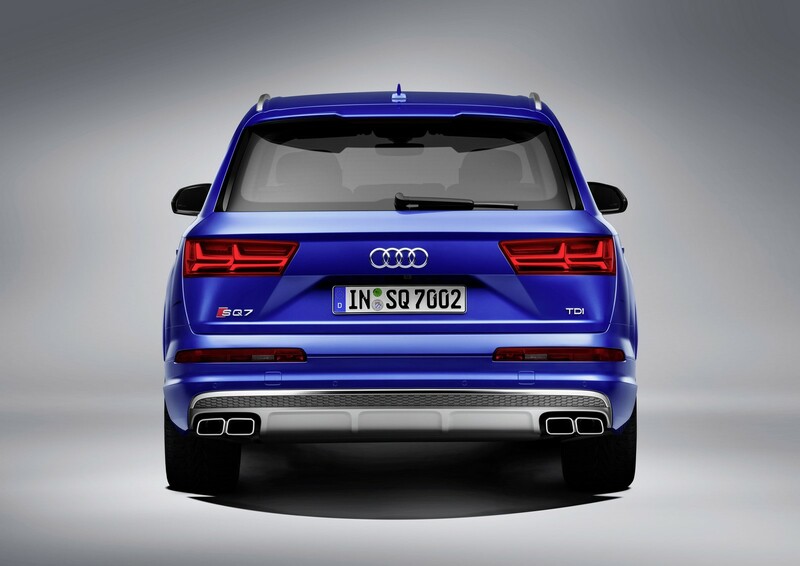 With the SQ7 TDI, customers have the choice between sport seats and sport seats plus. 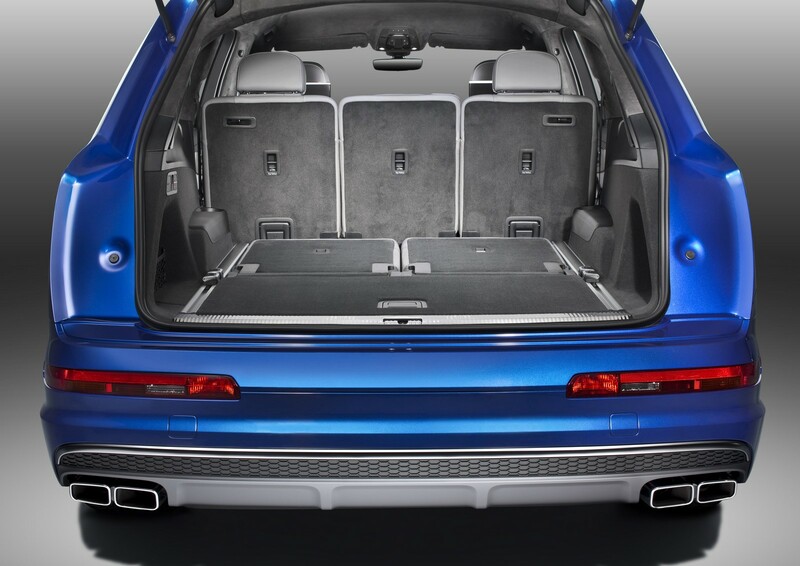 The sliding/folding seats provide for easier access to the optional third row. The power tailgate is standard. 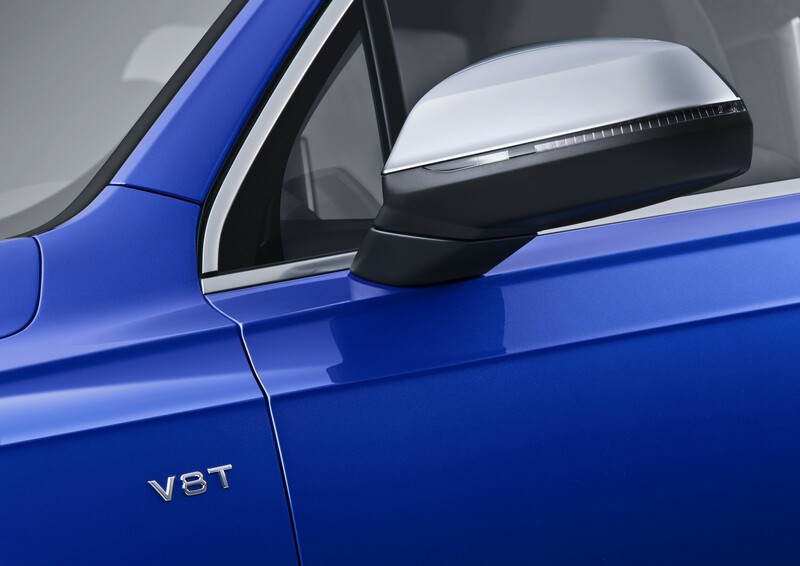 The SQ7 TDI boasts elegant design solutions in the interior, including analogue instruments with gray faces and white needles, special welcome screens and S badges. 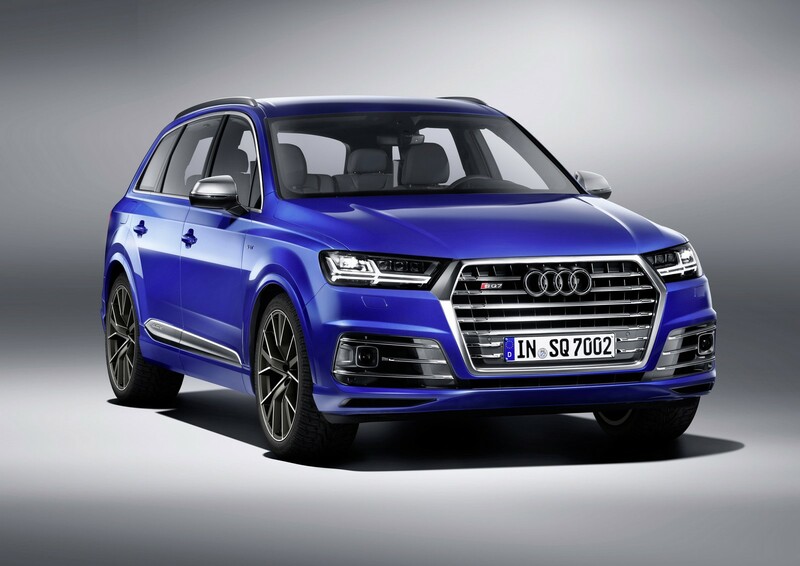 Markedly sporty: exclusive materials, colors and equipment features The new SQ7 TDI is available in 12 colors. 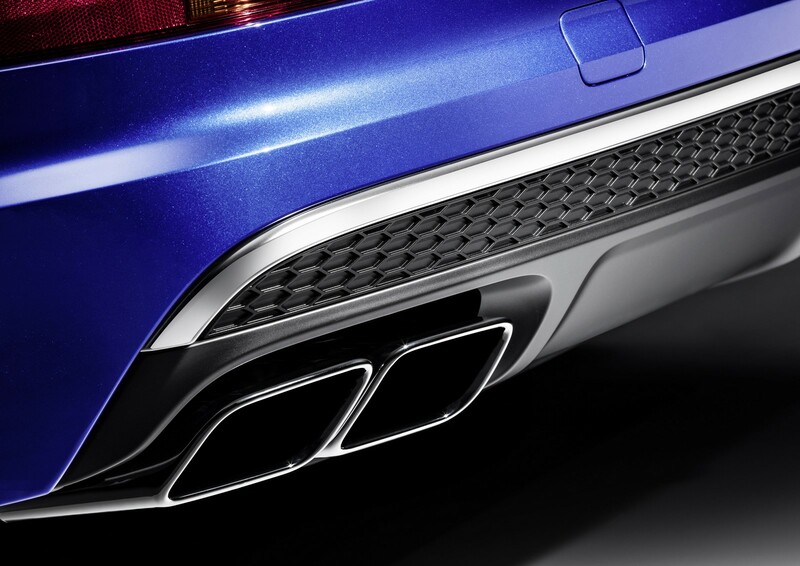 The distinctive radiator grille and underbody guard that encloses the four rectangular tailpipes are finished in twilight gray matt. 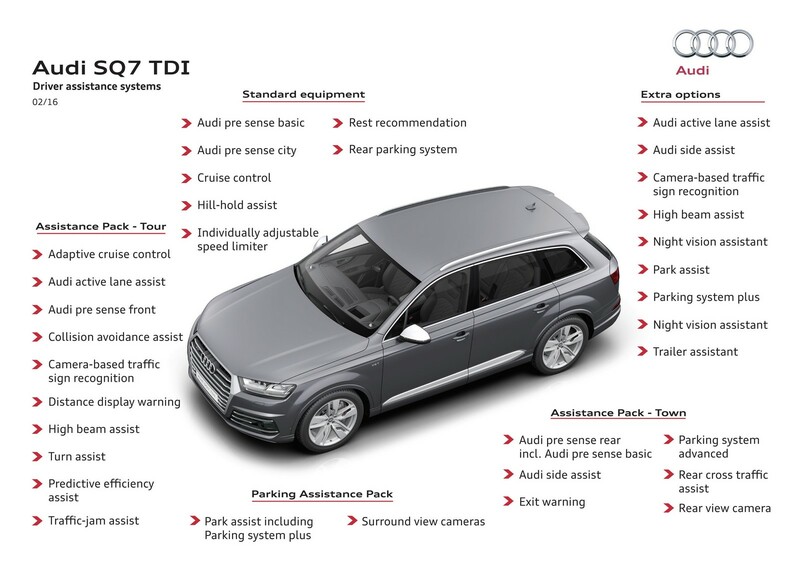 Thanks to a wide range of equipment, the SQ7 TDI can be configured to be both sporty and elegant. Two-piece applications enable diverse material combinations and further individualization. 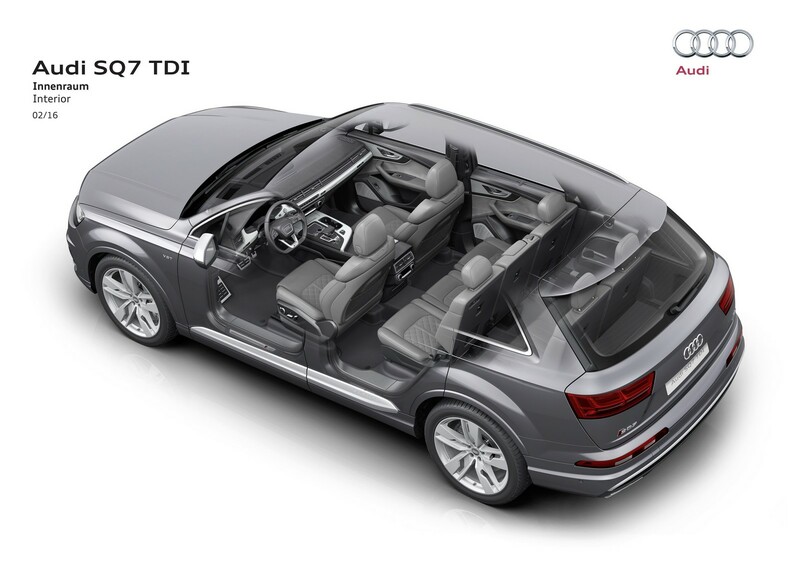 The SQ7 TDI is also available with the design selection Kodiak brown: a full-leather interior with contrasting stitching, an Alcantara black headlining, sport seats plus with Valcona leather in Kodiak brown and contrasting stitching, and luxury velour floor mats. 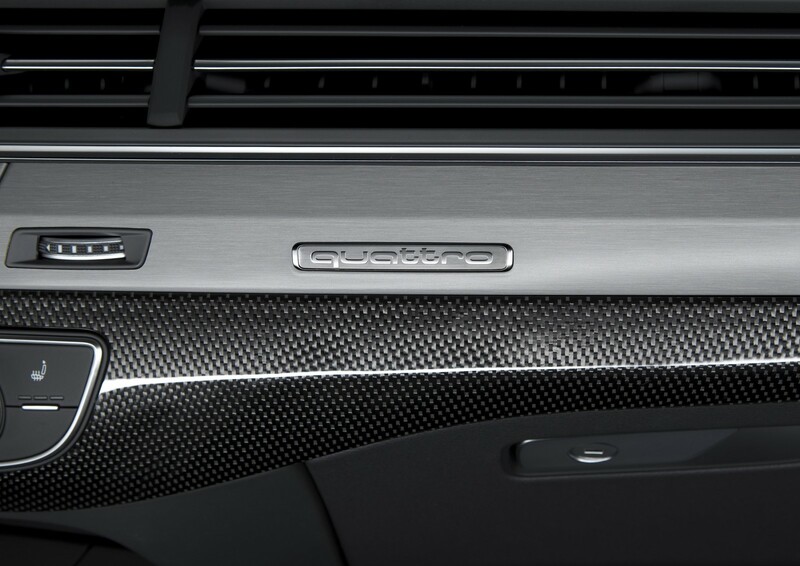 The two-piece trim strip of Sono aluminum and carbon twill copper is exclusively available for the SQ7 TDI. High-resolution graphics: Audi virtual cockpit With its 12.3‑inch display, the optional Audi virtual cockpit presents logically structured information in brilliant graphics. Driver ergonomics are excellent, and operation is intuitive. The driver chooses the display mode via the multifunction steering wheel. A head-up display is also available as an option. 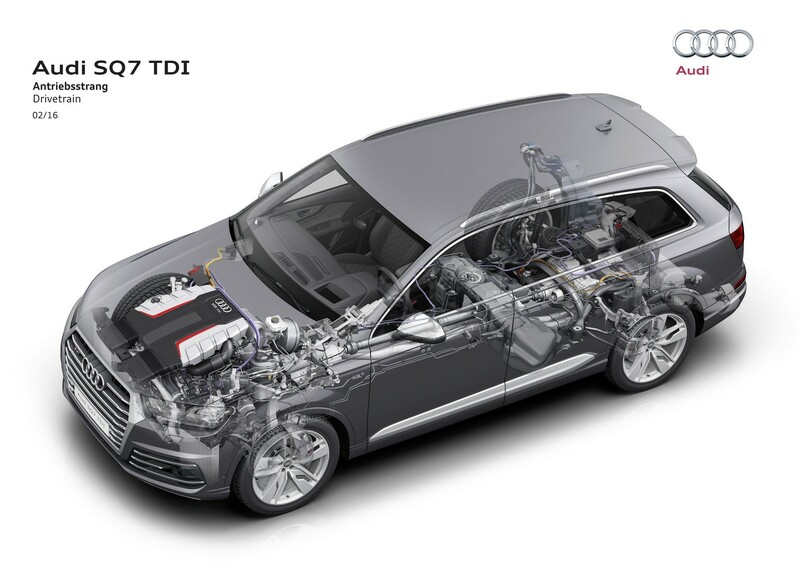 Potent computing power: Infotainment and Audi connect MMI navigation plus, the optional top-of-the-line infotainment system in the SQ7 TDI, uses the second-generation Modular Infotainment Platform. 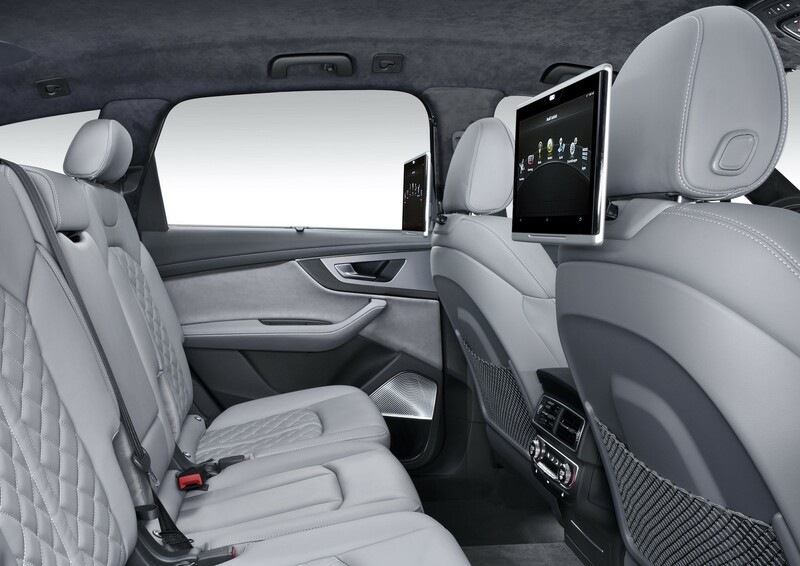 Thanks to the integrated LTE module and the Wi-Fi hotspot included in the Audi connect package, passengers can surf at high speed with their mobile devices. The Audi connect package brings comprehensive online functions on board. 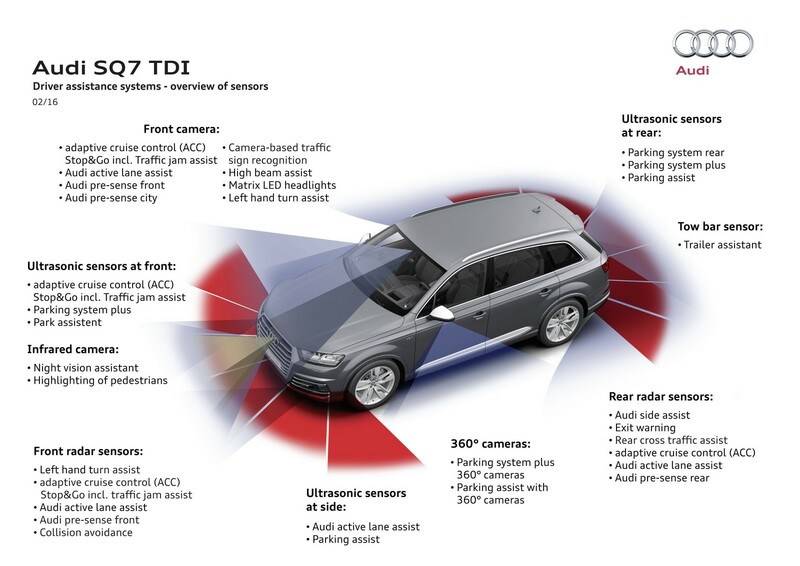 Simply the best: Driver assistance systems The SQ7 TDI offers a wide range of 24 driver assistance systems to help drivers travel safely, fuel-efficiently and comfortably. The predictive efficiency assistant, for example, provides additional information in the instrument cluster to help the driver save fuel. 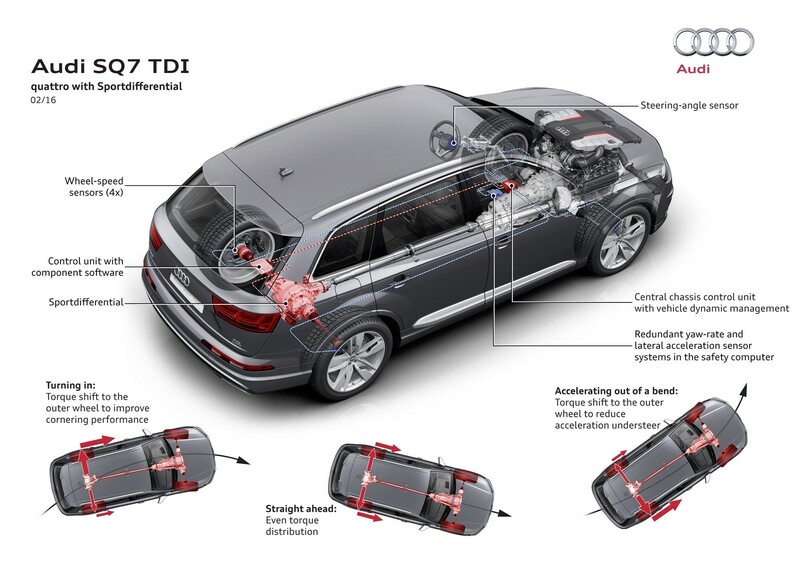 The standard Audi pre sense city – an anticipatory warning and emergency breaking function for avoiding accidents and protecting pedestrians – makes the SQ7 TDI even safer.